Looking at Sven Marquardt, you might think he’s a troublemaker. The burly 56-year-old is heavily tattooed and pierced, most notably on his face, wears sunglasses indoors and outdoors, doesn’t smile very often, and has an iron handshake. But looks can be deceiving and if anything, Marquardt is an advocate for tolerance. Best known as the gatekeeper of Berghain, one of the world’s most notorious clubs located in a former power plant in Berlin, the German is foremost an avant garde photographer. Extremely polite, observant, and intuitive, his intuition serves him not only in wandering around cities—he doesn’t like to tour the traditional way—but also helps him decide who gets into the club, and guides his photography. Marquardt visited Beirut in March for an exhibition of his works, held at D Beirut in the industrial Karantina area. He gave Executive Life an interview, with the help of an interpreter, on D Beirut’s windy rooftop. Organized by the Goethe Institute in Beirut, the photography exhibition “Rudel” and audiovisual installation “Black Box” were also part of a series of events held in partnership with nightlife group C U NXT SAT. Rudel showcased a row of large, impressive black and white portraits of Marquardt’s bouncer colleagues, captured in Berlin. The term Rudel (which literally translates to pack, as in a pack of wolves) stands for community and standing strong together, something his team definitely does. Despite his legendary status as the world’s most famous bouncer, Marquardt says of his work at Berghain that “it’s not a one-man-show” and says that the club is all about creating the right mix of people for everyone to enjoy themselves. In the portraits, every character is an individual, shot to reflect their identity. One of the men in the photos wears a tarboush, and curious Lebanese asked why—apparently he is part-Turkish. 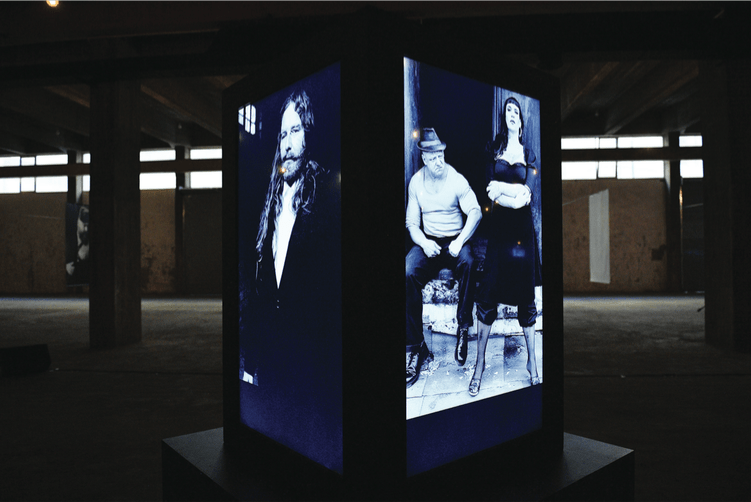 The parallel Black Box installation was literally a black box with changing photo projections on each side showcasing a larger selection of Marquardt’s photos, set to dark, melodic techno sounds created by German producer and DJ Marcel Dettmann, who he met in the late 1990s in Berlin’s club scene. Marquardt enjoyed working with an old acquaintance on Black Box, which represents the Berlin club context in terms of visuals and sound, but was created to be taken outside of it. Black Box showcases 50 photos on a loop that runs for about two hours, and following its premiere in Brazil in 2015, the exhibition has traveled to many countries. In Beirut it looked slightly different. Usually positioned inside a small room, here it was inside a massive warehouse space. Marquardt also gave a talk during his stay in Beirut, shedding light on his art and answering audience questions, many of which were geared toward his strict door policy at Berghain rather than his work. He told me he has had journalists go as far as showing him photos of random people and asking whether they would get in, questions he doesn’t like and doesn’t have an answer to. Growing up in East Berlin, Marquardt became interested in photography by chance and began his career documenting punk counterculture. After the fall of the Iron Curtain, Marquardt says many East Germans, including him, experienced an identity crisis, and he stopped taking photos at this time, forming a new identity and shifting to a career as a doorman when his DJ brother was organizing underground parties. Today he only takes photos in black and white on an analog camera, and prefers natural light. He was worried a few years ago that digital photography would kill the older method, but is happy to see a counter movement still embracing analog cameras. Marquardt says his photos are always staged and taken in his hometown, though he revealed during his stay that he is considering taking photos for the first time outside the German capital, possibly in Belgrade. The artist also works with brands, shooting campaigns for those looking for his distinctive aesthetic, and has even collaborated with Hugo Boss on a T-shirt collection featuring his images. Marquardt told me that upon his arrival to the Beirut airport he was given a few startled looks by airport security, but this is common. When I asked about his countless tattoos, he says that his skin is a canvas for the story of his life. I noticed he was wearing sneakers, something he swore he would never do in an older interview I had read online. Laughing, he responds, “never say never” and admits he discovered the sneaker only two years back. The two cities, worlds apart, have parallels that go beyond alliteration, former barriers—of bricks or bullets—as well as famous, though contrasting, party scenes. Though the internet often depicts Beirut’s party scene as wild, it’s quite docile compared to that of Berlin. Beirut still deserves credit for knowing how to have a good time, despite and perhaps because of its ongoing volatility. It’s interesting that both party scenes may have come from a similar need to rebel against, escape, or remedy harsh realities. Marquardt, who is known for bringing an eclectic mix together inside Berghain, is using his art to bring the same club culture to others. In Beirut, the exhibitions brought the two cities closer together for a distinctive visual and sound experience.